Whilst the Government is keen to make Goods and Services Tax (“GST”) a reality by envisaged April 1, 2017 deadline, efforts put in by the Government to look into the voluminous suggestions submitted by various stakeholders, on First cut Model GST Law (put on public domain on June 14, 2016), is indeed commendable. Honest attempt of the Government to eradicate the daunting provisions in the earlier Model GST Law, can be very well seen in the Revised Model GST Law which was made public on November 26, 2016. Apart from addressing key concerns of the Industry in a very decent manner, the Revised Model GST Law has also proposed an anti-profiteering mechanism to ensure benefit of lower taxes is shared with consumers, and also ensures no tax on securities and subsidies provided by the Government as also free of cost supplies. In our series of newsletters, we would be highlighting the changes made in each component of the Model GST Law along with decoding the changes brought in along with their implications, for easy digest. To start this journey of rendezvous with the Revised Model GST Law, the first part of the newsletter, deciphers the meaning of the taxable event i.e. Supply under GST. Determination of the taxable event in any tax law is of utmost significance as the levy of tax is based on occurrence of that event. In the Model GST Law, a uniform and single taxable event ‘supply’ would replace multiple taxable events i.e. manufacture, provision of service and sale, etc., as prevalent in the present regime. Thus, the constant monitoring and compliance required for keeping track of varied tax trigger points at present would fade away in GST, but, simultaneously, the term ‘supply’ will hold the greatest significance and shall be important in determining the taxability of all transactions, whether commercial or otherwise under GST regime. · Concept of supply without consideration still continues but Schedule I revamped to done away with nightmare situations like Business Assets/ services put to private or non-business use, Assets retained after deregistration, FOC Supplies, etc. · Certain exclusions have been provided in Schedule III and IV which would be out of taxable net. · Schedule IV dealing with activities or transactions undertaken by the Central Government, a State Government or any Local Authority in which they are engaged as public authorities, which shall neither be treated as supply of goods nor supply of services, was also present in earlier Model GST Law. · Schedule III has been now newly added which covers activities or transactions which shall neither be treated as supply of goods nor supply of services like services by an employee to employer in course of or in relation to his employment, services of funeral, burial etc. 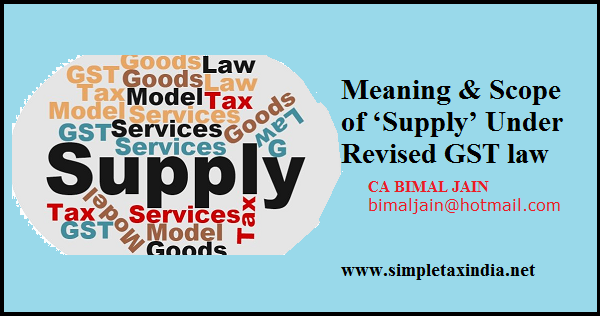 · The provision has been omitted in view of separate provisions inserted for taxability of services supplied through electronic commerce operator under chargeable section. Such persons would be liable to pay tax and supplies made by such persons would not be deemed supplies by them. In our next Article, we would cover analyses and impact of the changes made in Schedule I to the Model CGST/SGST Act, 2016.